For the crust: Whisk flour, sugar and salt in medium bowl. Add butter. Use a pastry blender or 2 forks to blend in butter until mixture resembles coarse crumbs. Add in 2 tablespoons of ice water and stir with fork until mixture is evenly moistened, adding more ice water by teaspoonfuls if mixture is dry. Gather dough into ball; flatten into disk. Wrap dough in plastic and chill at least 1 hour. Soften dough slightly at room temperature before rolling out. For the streusel topping: Blend flour, sugar, crystallized ginger, orange peel and salt in a food processor. Add butter and pulse until coarse crumbs form. Blend in milk (mixture will resemble moist coarse crumbs). Transfer mixture to medium bowl. Stir in almonds. Cover and chill. For the filling: Gently toss blueberries, raspberries, blackberries, 1/2 cup sugar and lemon juice in a large bowl. Let stand 10 minutes. Mix cornstarch and remaining 2 tablespoons of sugar in a small bowl. Add to berry mixture and gently toss to coat. To assemble: Preheat oven to 400 degrees. On a lightly floured surface roll out pie crust into a 12-inch round. Lay in your 9-inch pie plate. 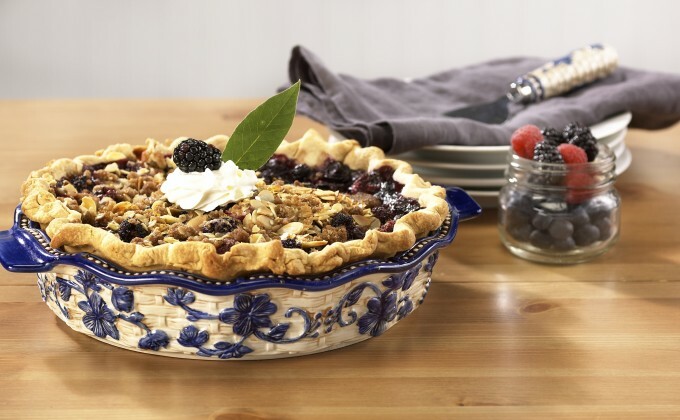 Turn pie crust edge under, forming high-standing rim extending 1/4 inch above sides of pie dish; crimp edge decoratively. Fill with berry mixture and bake for 30 minutes. Remove pie from oven and reduce heat to 375 degrees. Sprinkle streusel topping evenly over berry pie filling. Return pie to oven and bake until crust is golden brown and berry juices are bubbling thickly, about 40 minutes. Transfer pie to rack and cool completely.